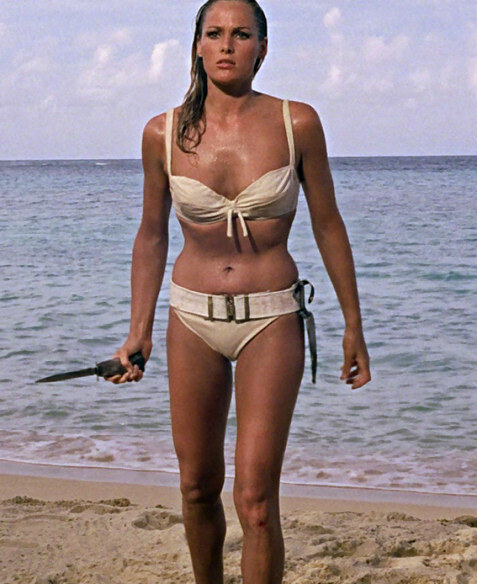 There have been many iconic moments in the James Bond films over the years, but Ursula Andress emerging from the ocean onto the beach in the first Bond film, “Dr. No,” may be one of the most memorable. In her portrayal of Honey Ryder, Andress set the standard for the beautiful Bond girls, and the producers smartly made sure to live up to that standard time and again. We have a clip of the scene below, along with a slideshow with Ursula showing off her bikini body. Check back as we’ll be featuring all of the Bond movies along with many of the best Bond babes from all the films. It’s pretty interesting to see how hot Jane Fonda was back in the day, and “Barbarella” ranks up there as Jane’s most titillating role. In the film, Jane performs a zero-gravity striptease, seduces an angel and still has time to save the universe! Her Barbarella character is a sultry space adventurer in the ultimate sci-fi romp. The cover art for this film is just awesome. The film is out today on Blu-ray so you can enjoy the lovely Jane in super high def on your big screen in all her late-60s big hair glory. Jane Fonda helped make this wild and outrageous film a cult classic. It was directed by Roger Vadim (Fonda’s ex-husband) and was filmed at the height of the psychedelic era. Enjoy the two clips below. Diehard fans of classic Hollywood starlet Raquel Welch will be happy to know that another of her films has been released on DVD. In “Flareup,” Raquel stars as a go-go dancer stalked from Las Vegas to Los Angeles by the psychopathic ex-husband of her friend. The trailer above is classic, as the dancing scenes from Raquel and her amazing figure are front and center in the promotion of the film. “Flareup” was released in 1969 and isn’t a particularly memorable film, so we’re assuming only her most ardent fans will check it out. But Raquel looks amazing as usual and she delivers a solid performance.